Thanks to Dr. Keith Sweeney, Stony Brook University Hospital, New York, for contributing this case, Dr. Belinda Lategan, St. Boniface Hospital, Winnipeg, Manitoba (Canada), for writing the discussion and Dr. Raul S. Gonzalez, University of Rochester Medical Center, New York, for editorial review. To contribute a Case of the Week, first make sure that we are currently accepting cases, then follow the guidelines on our main Case of the Week page. (1) Twice a year, PathologyOutlines.com donates 10% of our Amazon commission to a non-profit. For the first half of 2017, we contributed $540 to the Make-A-Wish Foundation. For the second half of 2017, we will be contributing to the Detroit College Promise, the nonprofit we started that provides scholarships to Detroit Public School students. To help support these efforts, just use our Amazon.com link on our Home Page or Books pages to buy Pathology books, non Pathology related books or any other items. Thank you for your support! (2) If your email address has just changed, please let us know. You can change it yourself by clicking here, then fill in the box at the bottom with your current email address and follow the instructions, or send an email to NatPernick@gmail.com with the old and new email addresses. (3) Congratulations to Dr. Abha Soni, Johns Hopkins University, Maryland (USA), winner of our Commercial Email drawing and a $50 Amazon gift card. Make sure you sign up for this email by clicking here and when our next Commercial Email is sent out, follow the easy instructions to get in the drawing. A 37 week, full term twin boy with a known abdominal mass in utero (ultrasound showed a left upper quadrant echogenic mass) was evaluated after an uneventful cesarean section. Abdominal MRI showed a well circumscribed, exophytic mass with smooth margins arising from the left hepatic lobe and measuring 5.6 x 5.3 x 3.8 cm. The mass was resected 4 days after delivery. Infantile hepatic hemangioma (infantile hemangioendothelioma) is the most common benign hepatic tumor of infancy. Infantile hepatic hemangioma is the term preferred in the pathology literature based on the classification of Mulliken and Glowacki (Plast Reconstr Surg 1982;69:412), and has been adopted by the International Society for the Study of Vascular Anomalies (Pediatr Int 2014;56:304). Although solitary in 50% of cases, as many as 100 tumors have been described in a single person (South Med J 2014;107:159). Serious clinical symptoms may occur and include anemia, congestive heart failure due to a high flow state and Kasabach-Merritt syndrome (bleeding diathesis due to platelet sequestration). Rarely, patients may present with acute hemoperitoneum due to rupture (Modern Pathology 2014;27:472, Radiographics 2010;30:801, Bosman: WHO Classification of Tumours of the Digestive System, 4th Edition, 2010. In populations screened by modern imaging techniques, prenatal diagnosis or diagnosis in the first 6 months of life is the norm. There is a slight female predominance and an increased prevalence in patients with hemihypertrophy and Beckwith-Wiedemann syndrome. On gross examination, lesions are well circumscribed and vary from red-brown and spongy to tan-white and firm. 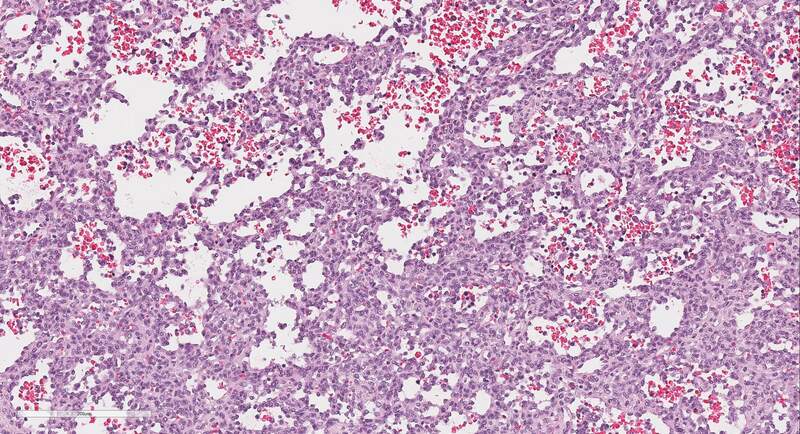 Histiology shows a benign vascular neoplasm composed of anastomosing capillary and cavernous sized vascular spaces lined by plump endothelial cells. There is no atypia. The stroma is generally scant and fibrous to myxoid. Extramedullary hematopoiesis is common. Hemorrhage and infarction, fibrosis, dystrophic calcification and adipose stroma can be seen in areas of degeneration. Small bile ducts are rarely seen within the lesion. The endothelial cells are strongly reactive with CD34. The differential diagnosis for benign hepatic mass lesions in children also includes mesenchymal hamartoma, focal nodular hyperplasia (FNH), nodular regenerative hyperplasia (NRH) and hepatocellular adenoma (HA). Mesenchymal hamartomas are mesenchymal lesions containing fluid filled cysts varying in size and number. 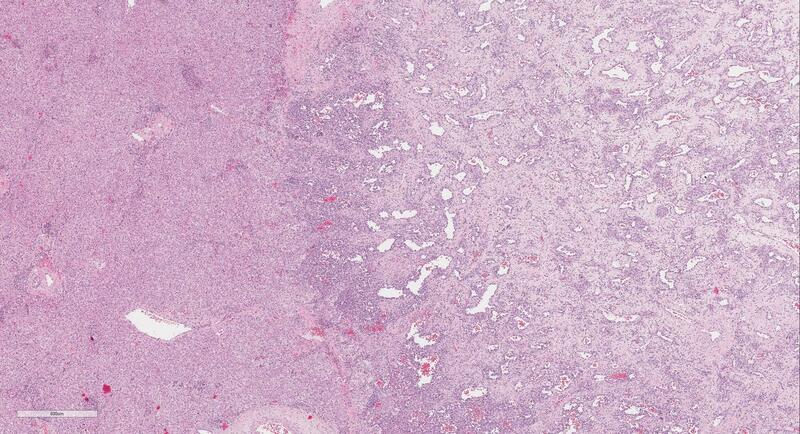 The other three lesions (FNH, NRH and HA) are composed of hepatocytes. Cavernous hemangioma is uncommon in children and lacks a capillary sized vascular component. Epithelioid hemangioendothelioma has a zonal pattern with sinusoidal proliferation at the periphery and a midzone with increased myxochondroid stroma. The perivenular stroma is paucicellular and often calcified. 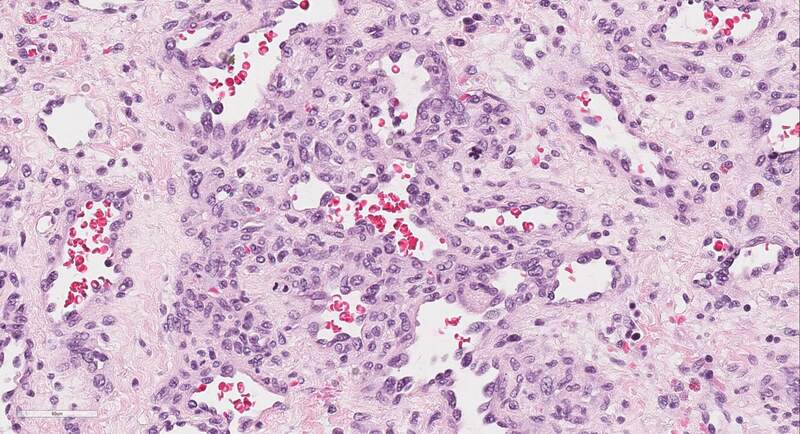 The tumor cells of epithelioid hemangioendothelioma have intracellular vascular lumina containing red blood cells. 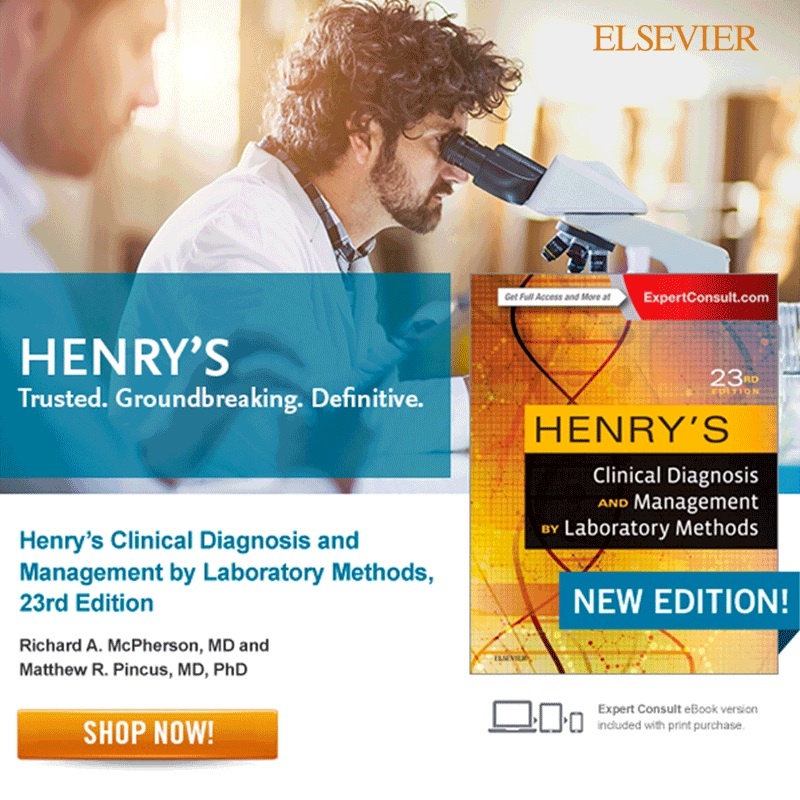 The clinical course is intermediate between hemangioma and angiosarcoma (Radiographics 2012;32:789, Sternberg's Diagnostic Surgical Pathology, 6th Edition, 2015). 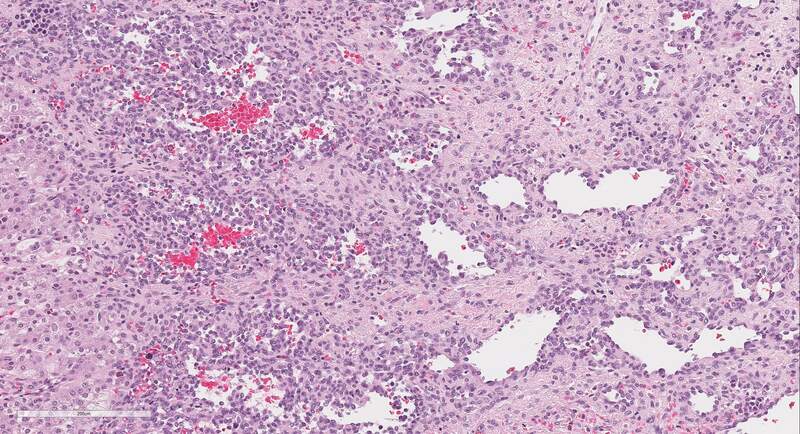 As in adults, metastases are the most common malignant tumors in the pediatric population. The most common primary hepatic malignancies in children are hepatoblastoma and hepatocellular carcinoma. 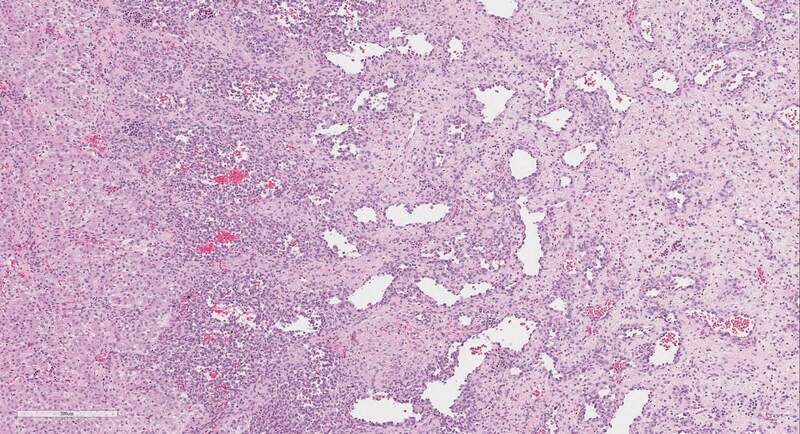 Among vascular lesions, angiosarcoma is an important differential diagnosis. 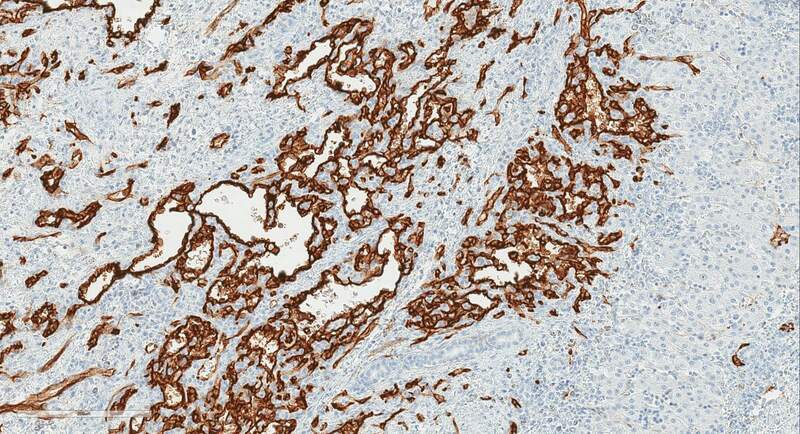 In angiosarcoma, the vascular spaces are irregular, poorly defined and lined by atypical, pleomorphic, hyperchromatic endothelial cells with frequent mitoses (Modern Pathology 2014;27:472). 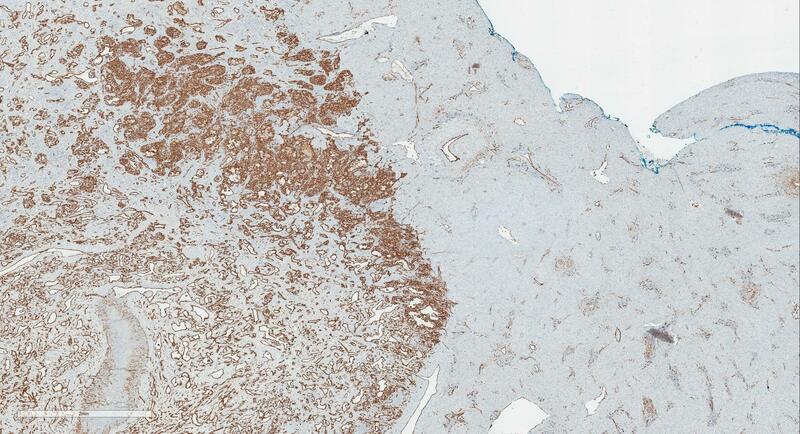 GLUT1 immunostaining is associated with clinical presentation and course. Multifocal lesions are usually GLUT1 positive and involute spontaneously following a period of proliferation. Focal lesions are usually GLUT1 negative and involute by 12 to 14 months of age. Diffuse lesions are also GLUT1 positive but have a more complicated clinical course (J Clin Pathol 2004;57:1197, J Pediatr Surg 2005;40:801).